Sci-Mx Mass System is an advanced engineered meal replacement formula that is designed for active people who demand the benefits of top quality proteins, increased amounts of complex carbohydrates, and nutrients for optimum health and muscle performance. Sci-Mx Muscle Fuel Mass is specially designed for individuals that find it hard to gain mass (hard gainers), as well as endurance athletes that need a high carbohydrate meal along with a strenuous endurance training program. Since carbohydrates are "protein-sparing" , this will help these athletes not to loose unnecessary muscle with this kind of training program. Studies suggest that using a variety of protein substrates may work best for improving protein synthesis and overall health. Unlike other meal replacement formulas, Sci-Mx Muscle Fuel Mass is low in sugar and also offers a variety of anti-catabolic amino acids. This unique formula combines high biological value proteins with very low glycemic index carbohydrate to build and repair muscle tissue while balancing nitrogen levels during workouts. Sci-MX Muscle Fuel Mass has just enough carbohydrates are used to fuel a strenuous endurance workout, and replenish depleted glycogen. It is designed to pack muscle on even the hardest of the hard gainers with elevated protein-to-carb ratio and a level of quality protein that guarantees an anabolic environment for muscle growth and performance. 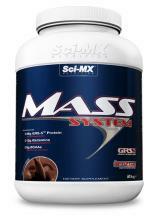 Sci-MX's Muscle Fuel Mass is a complete meal that is very low in fat, great tasting and easily digested. * Mixes easily with water into a thick delicious shake � USN products are renowned for their great taste! Want even better discounts on USN supplements? Check our Trade Price Sci-MX Supplements store! All tubs contain 3 seperate foil sachets per tub ensuring freshness and ease of storage.